Super Hero Boy: Kodak at the Consumer Electronic Show! Win a new Kodak Digital Frame! Kodak at the Consumer Electronic Show! Win a new Kodak Digital Frame! I'm stuck at home today in freezing temperatures with weather that threatens snow in Alabama. Something just seems so wrong about that when I could be having a blast at the Kodak booth today at the 2010 Consumer Electronic Show in Las Vegas!! Sadly being 33 weeks pregnant travel was not in my future but luckly Kodak is bringing the show directly into my office via live streaming video of their discussion panels today and tomorrow. Log into the Kodak's K-Zone live streaming from the CES show in Las Vegas on their website www.kodak.com/go/ces! You can also participate in the discussion live via twitter using the hashtag #KZone. Kodak is offering one of our readers a chance to win a Kodak D830 Digital Frame! The Kodak D830 Digital Frame is really unique in the fact that you can customize the digital photo frame by using your own outer frames. The unit fits into most standard sized photo frames so you can choose how it looks to best match your own home! As well it features Kodak's Quick Touch Border which allows you to scroll through your pictures with the touch of your finger. With 512mb of internal memory and two memory card slots you can display as many photos as you wish! I plan on using mine to display pictures of Connor and the new baby! It's a $140 value and all you have to do is check out one of Kodak's awesome CES discussion panels! To win all you have to do is check out one of the streaming panels from CES and The K-Zone at www.kodak.com/go/ces and let us know which panel you watched! Let us know something about why you choose to watch that particular panel and what you learned! For those of you that cant attend the online CES panels. Visit the Kodak website and tell us which product you'd most like to have and why it would make a difference for your family. Just to be fair if your not attending tell us which session you would have most liked to have seen as well. Let people know about the giveaway on Twitter using : Watch Kodak's K-Zone Live at CES for a chance to win a digital frame visit http://bit.ly/6gn7Pc #KZone @angelaandconnor Please RT! Ask a question on Twitter during one of the live feeds using hashtag #KZone and @angelaandconnor for an extra entry. This contest will end Jan 31st. I'd love to have the KODAK EASYSHARE C1013 Digital Camera. Our camera is really old and not so reliable any longer. The panel that would be most interesting to me is "Is This Thing On?" to help me keep up with all of the technology advances that my grandkids love. From Kodak, I would love this in my office: KODAK ESP 9 All-in-One Printer. The panel I am profoundly interested in is the It's All About KISS. I have been an advocate for simplifying life and scaling down for many years, and it is refreshing to see my philosophy shared, and discussed in an open forum. KODAK ESP 9 All-in-One Printer. I watched Help, My Mom Friended Me on Facebook. I picked this one to watch because I have two sons, one age 21 and the other 16. The 21 year old does not have a FB account and the 16 year old does. I learned that you must be 13 years old or older to have a FB account. I watched my brand name is and learned that you have to continue to market your brand to keep people's interests. The newly announce Play Sport camera is now on my wish list. I would have loved to see the KISS webcast - simple things are the best! I really love the PULSE frame because you can get photos from facebook, etc! I would have attended the Chief Memory Officer one, because that is one of my main duties!! I would love KODAK ESP 9 All-in-One Printer. The KISS panel was interesting as I am looking to simplify my life and reduce stress. I love the KODAK ESP 9 All-in-One Printer because I will soon be working from home. I was most interested in The New CMO: Chief Memory Officer but it was on past my bedtime. I've been wanting my "own" digital camera so I would love a C190. And if I could be there, I'd attend the Mommy Tech panel since I'm not very savvy! Thank you for the giveaway! I"d most like the OLED wireless frame- it's pricey but it would be so great to have access to all our favorite photos wirelessly. Would love one of these frames for my holiday photos, and also to use the whole year through! I would love to get a Kodak Zi8 digital video camera to capture great family moments! I wasn't able to watch any of the forums, but It's All About KISS was the one I would have been most interested in. As to which other product I would be interested in, the new SLICE camera is intriguing. Everything else is going touchscreen, I guess it was inevitable that cameras would as well. The Kodak theatre HD player sounds amazing. It would be great to display the kid's photos during family get-togethers. I would of have attended the Fathers Knows best panel with the hubby. I'd love to have the KODAK EASYSHARE C1013 Digital Camera. I watched the M-Suite panel. I wanted to watch that one because I would also love to have a home-based business, so I wanted to hear what they had to say. I learned that connecting with people thru blogs is what works best to get your business going. Thanks! I watched the replay of "It’s All About KISS". I really enjoyed the discussion of how we have all had technology let us down at some time or another. The KISS philosophy may be the answer. I would also like to try out their "KODAK ESP 7 All-in-One Printer"
Help, My Mom Friended Me on Facebook! Not only my mom, but tons of older relatives are now visiting mine and my husband's pages! I learned I have to balance the desire to reveal myself, with the need to be tactful...unless I want to hurt their feelings and de-friend them. I like the pulse frame. Thanks for the chance. The OMG, BFF, LOL sounds good. I wish I would've seen the M-Suite panel. I would love to find a way to work from home. Thanks! I would love the KODAK EASYSHARE Z980 Digital Camera. I most likely would have attended the The M-Suite as I'm a stay at home mom who could learn to start a business. The Help, My Mom Friended Me on Facebook is the one I chose. My friends and I have been discussing how a lot of our older relatives are getting on there now. I learned how to manage my privacy settings to keep certain people from seeing certain things. The session i would have likeed t o have seen is the Kiss. I think it's important to showcase women in technology. The product that i would like froom Kodak is the the quik tripod. i love photography and it would be nice to added it to my gear, thanks! i'd like to see it's all about kiss! 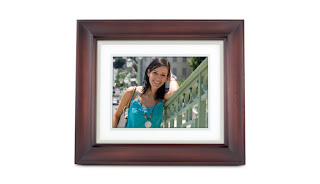 I want a kodak easy share esp 7 & this frame of course! I also love their ESP 7 printer, it sounds fantastic! I would have been interested in It's All About KISS, my life really needs some simplifying. Thank you! I watched the all about kiss and learned about savings! I missed it, but I would love to have their Kodak Z980 camera! The Zi8 Digital Video Camera would be cool so that I can see km kids that live away from home! "Is This Thing On?" sounds like a cool program. I missed the panels but checked out Kodak's website; I'd like the M530 digital camera for my next digital camera purchase! And I'd definitely get the red one! I watched it K.I.S.S. because I am constantly trying to simplify my life. I could do some serious damage with the C190. It would allow me to do basic editing and cropping for personal use. I would like the Z915 digital camera, and I would be curious what the dads had to say on the panel. I like the KODAK ESP 9 All-in-One Printer because my hubby works mostly from him and this would save him more time from having to go into the office. Im not able to watch the CES Panels but here is the answeres you need. i would like to watch the The M-Suite (Friday, January 8 at 3:00 p.m. PST)... this is because i would love to know how these women do it. what there daily lives are like. picking an item from the kodak website would be KODAK EASYSHARE Z1015 IS Digital Camera, i chose this for its performance. Id like it for my daughter. She is 5 yrs old and you are never to young to follow in mommy's foot steps. Im a photographer and im sure she would enjoy learning. I watched "Is this thing on"
I would love to have the KODAK Zi8 Pocket Video Camera / Black because then I would be able to record special/family events, along with everyday moments. I would have liked to have seen Help, My Mom Friended Me on Facebook!